The Belgian- Dutch design duo, Studio Job. Studio Job is a love-'em-or-hate-'em Belgian-Dutch design duo. 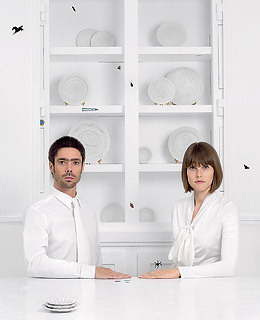 Critics reject the pair's penchant for pricey, obscure pieces over affordable, functional objects. Museum curators and gallery owners praise them as leaders in the hot Expressionist-design movement. The face-off can continue this month, in Milan, when the team behind Studio JobJob Smeets, above left, and Nynke Tynagelunveils its latest lightning rod: Silver Ware, a line of "monumental" pieces. "To give you an idea of scale," explains Smeets, "the teapot is 2 meters high." The studio's delft-inspired mantel clock, painted with critters, or its crystal-studded table lamp would probably be a better fit for most homes.